BILLINGS, MT - The Pioneer League pf Professional Baseball has announced its roster for the 4th annual PBL vs. NWL (Northwest League) All-Star Game to be played Tuesday, August 7th at Suplizio Field in Grand Junction, CO.
Three Billings Mustangs players were named to the Pioneer League 28-man roster. Joining the Pioneer League in Grand Junction is starting pitcher Jared Solomon, catcher/first basebman Pabel Manzanero, and relief pitcher Eddy Demurias. Solomon has 4-2 record this year with 2.27 earned-run average, 54 strikeouts over 47.2 innings. Manzanero is hitting .319 over 39 games this season with 5 home runs and 24 RBIs. Demurias has 0-2 record with a 4.63 earned-run average over 10 games this season. 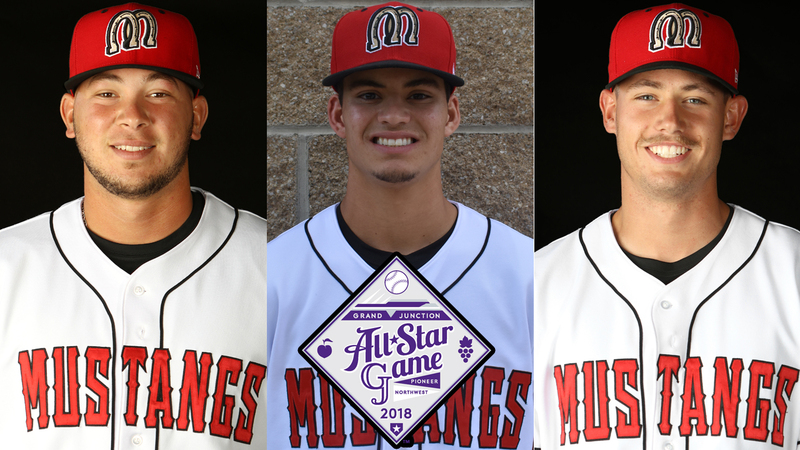 The Mustangs return home after the All-Star Game break with a seven game home stand again the Ogden Raptors and the Idaho Falls Chukars on Thursday, August 9th. For more information, call the Mustangs Business Office at 406-252-1241.